Julia Terry tells Clare Lomas about what it means to be the UK’s first mental health nurse to be awarded a fellowship with the National Institute for Health and Care Excellence. Julia Terry helps to shape NICE guidance. 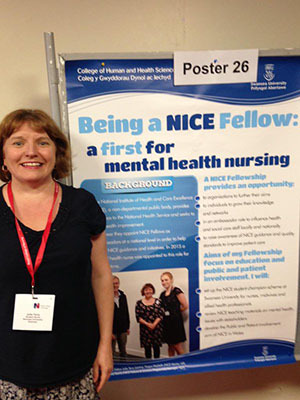 Now an associate professor at Swansea University, Ms Terry was a senior lecturer when she applied for the NICE fellowship, and is convinced this was a key factor in her promotion. ‘A NICE fellowship is a 3-year opportunity to further your knowledge and influence in your specialist area of practice,’ she says. NICE provides guidance to the NHS and aims to improve care. Every year, it appoints health and social care staff as NICE fellows, who work to raise the profile of the organisation and promote high-quality care and innovative practices. The fellows also act as ambassadors to help shape NICE guidance and improvement initiatives. Setting up the NICE student champion scheme at the university for nurses, midwives and allied health professionals. Developing and promoting teaching resources to inform health professionals about NICE, including reviewing teaching materials on mental health issues. Developing public and patient involvement initiatives in Wales, in partnership with the government. Ms Terry says the NICE fellowship has given her the opportunity to better understand how NICE discusses and develops guidelines. further the aims of organisations. develop their knowledge and network. act as an ambassador, influencing health and social care locally and nationally. raise awareness of NICE guidance and quality standards. ‘This is an excellent opportunity to learn more about the workings of NICE and to link it with a health improvement project in your specialist area,’ says Ms Terry. ‘Mental health nursing is going through some challenging times, so the opportunity to have a voice, and to see service users actively involved with a large public body, is encouraging’. NICE also runs a 1-year scholarship scheme, in which individuals undertake a supported improvement project related to NICE guidance. To find out more about NICE fellows and scholars, and to apply for the 2017 fellows intake, go to: www.nice.org.uk/get-involved/fellows-and-scholars. Fellowship applications for 2017 close on 4 November 2016.